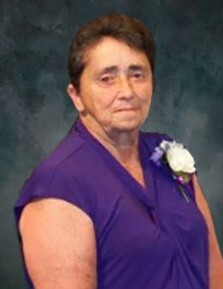 Alice D. Bellefeuille 77, of Callaway MN passed away Wednesday, April 3, 2019 surrounded by her loved ones at Eventide Senior Living Community in Fargo, ND. Mass of Christian Burial will be held Tuesday, April 9 at 11AM in Assumption Catholic Church, Callaway, MN. Visitation will be held Monday, April 8 at David Donehower Funeral Home from 5pm-7pm with a 6:30pm Prayer Service. Visitation will also continue one hour prior to Mass on Tuesday. Alice was born May 25th, 1941 to Arthur and Dorothy (Jodoin) LaChapelle of Voluntown, CT. She was united in marriage to Phillip Bellefeuille on May 2nd, 1964. They moved to Minnesota and raised their three daughters and three sons. Alice was a very active member of the Detroit Lakes American Legion Auxiliary since 1998. The source of her joy came from time spent with friends and family. She is survived by her husband Phillip of Callaway, MN. Her daughters Lisa (Brian) Hanson Detroit Lakes, MN, Mauna St. John Fargo, ND, Debra(Kelly)Peters Fargo, ND, Her sons David (Michelle) Barnesville, MN, Thomas(Tina) Chipley, FL, Michael (Chris) Bellefeuille Fargo, ND. 11 grandchildren, and 3 great grandchildren. Her brother Michael (Roni) LaChapelle Sr. Voluntown, CT and many nieces, nephews and special friends. Loved ones who have preceded her death are her parents Arthur and Dorothy LaChapelle and her beloved grandson Greg. Alice’s family extends a warm “Thank You” to the Ecumen Transitional Care Team in Detroit Lakes for their exceptional care and love during her transition to Eventide.